Aurora Gold Mine Opening. Photo by Guyana Goldfields. Canada’s Guyana Goldfields is set to invest $120 million to conduct underground gold mining for the first time in Guyana’s history. In an event held Sunday in the South American country, the company’s President and CEO, Scott Caldwell, said that by the end of the month he will provide the results of an ongoing feasibility study on underground mining at the Aurora Gold Mine. The project, 100%-owned by Guyana Goldfields, achieved commercial production in January 2016 and produced 160,000 ounces of gold in 2017. According to Caldwell, the company underground operations are aimed at extracting more than 2 million ounces of the yellow metal. Aurora has a total gold resource of 6.25 million ounces in the measured and indicated categories, as well as an additional 1.79 million ounces in the inferred category. Going below surface would allow the mid-tier producer to extract higher quality gold at a cheaper price. “Gold prices are better and we see the opportunity to do so,” Caldwell told local media. The feasibility study assumes that underground mining at the site’s Rory's Knoll will utilise open benching and sublevel retreat mining methods with mining concluding at a depth of -770 metres below sea level. Plans of going underground also have the potential of causing “less surface disturbance” to the environment, the executive said. 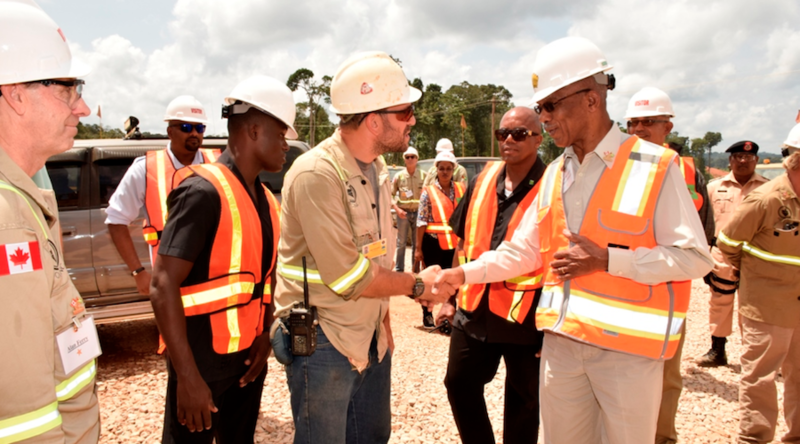 Guyana Goldfields’ president also acknowledged that the firm is monitoring the developments regarding the Guyana/Venezuela long-running border controversy, which was recently referred to the International Court of Justice by the United Nations. However, Scott Caldwell said he is not too concerned about it. Since international court actions support the existing border, he said that his company and others operating in the area, such as Exxon, don’t foresee major changes taking place. “We do monitor it and we talk to the Guyanese and Canadian and US governments [but] it’s not an issue,” he is quoted as saying at the press conference. The Aurora mine is located in the Essequibo Region, which was ceded in the 19th Century and is being claimed back by the neighbouring country since 1962.